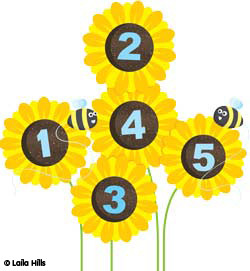 Development matters: develop an awareness of number names through their enjoyment of action rhymes and songs that relate to their experience of numbers (8-20 months); recognise numerals 1 to 5 (40-60+ months). Early learning goal: children count reliably with numbers from 1 to 20, place them in order and say which number is one more or one less than a given number. Using quantities and objects, they add and subtract two single-digit numbers and count on or back to find the answer.